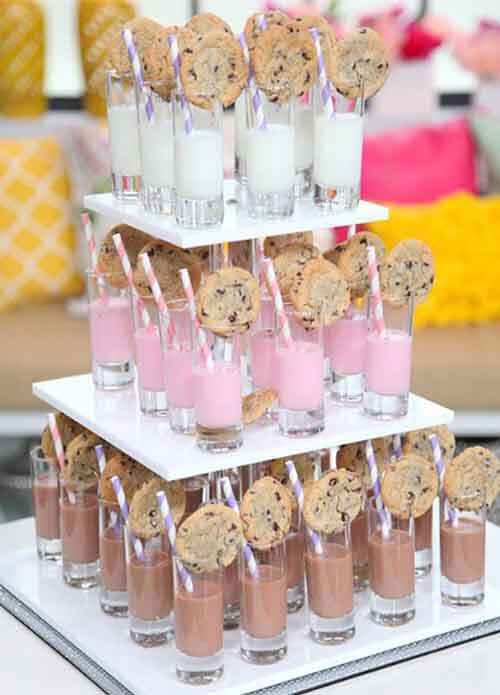 Easy Dessert Table Ideas—that you can actually do! 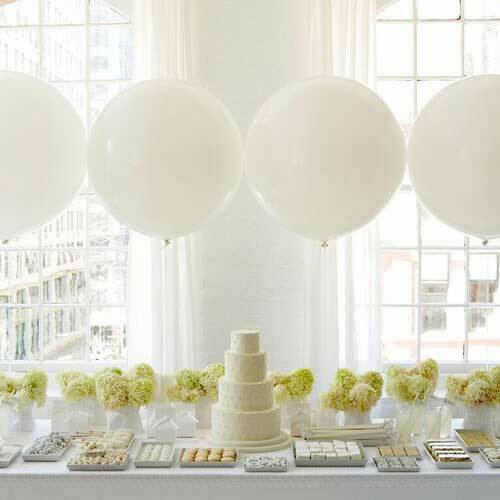 I always think it’s a good idea to concentrate the majority of your party decorations around a buffet/dessert table. 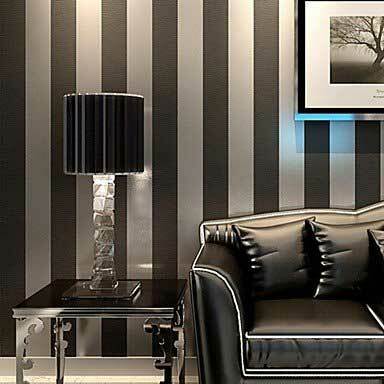 This will create a focal point in the room. 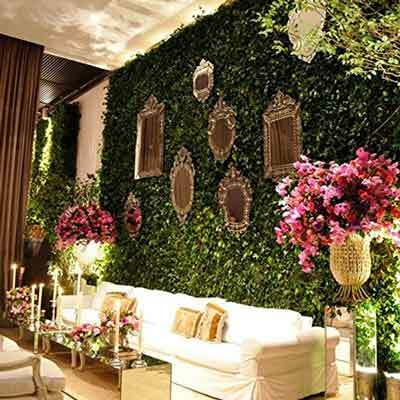 Decorations often have to compete with existing room decor so they can get a bit lost if spread too thinly. I think you’re far better off creating one really well themed feature wall that everyone’s eye will be drawn to. 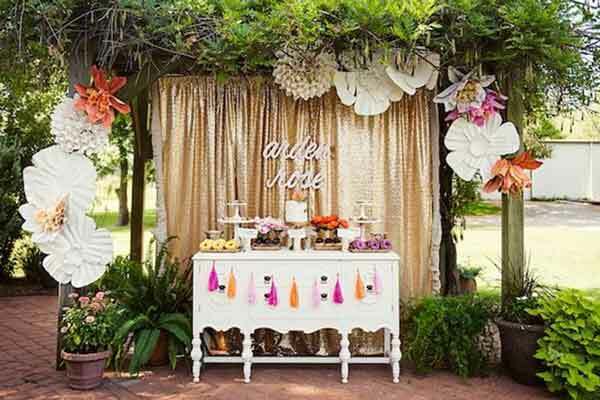 You can then use a few general decorations around the rest of the room to tie everything together. 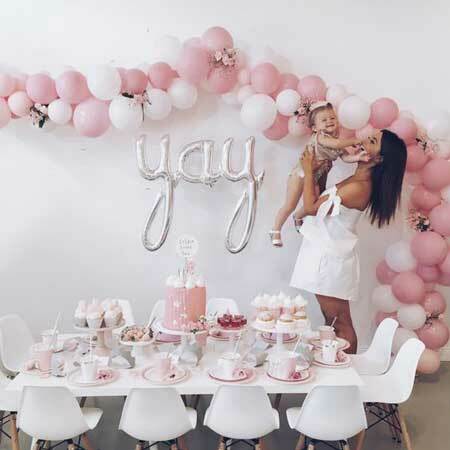 If you're fed up trying to recreate all those immaculately styled dessert tables you see on Pinterest (and wondering why yours turn out more like a 3rd grade arts & crafts project! ), then check out my tips and suggestions below. 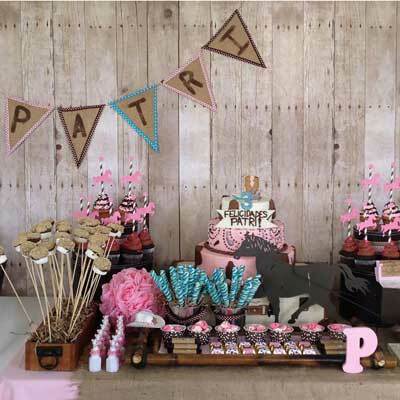 These dessert table ideas for birthday parties, weddings, or baby showers, can easily be recreated at home and there's something for every type of budget. 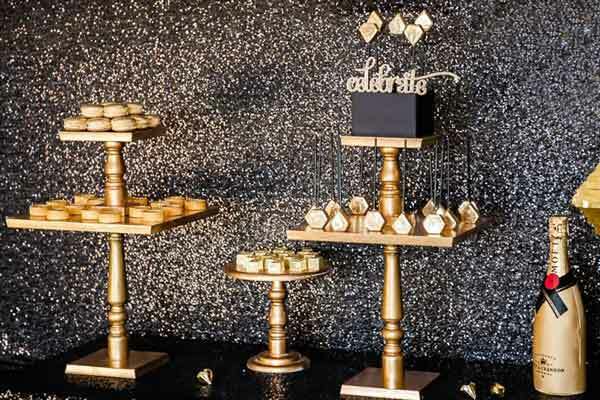 Remember, you can also apply these decorating tips to a general buffet table, food station, or drinks bar—you don't need to have a dedicated candy bar/dessert table. 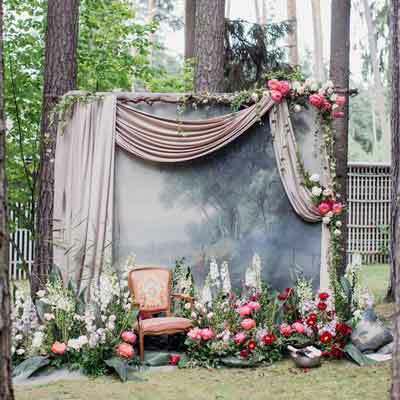 On this page, We'll look at different ideas for the main component; the backdrop, along with tips and suggestions for how best to construct, support, display, or hang this. Then, on the continuing pages, we'll look more closely at the actual food styling and presentation. 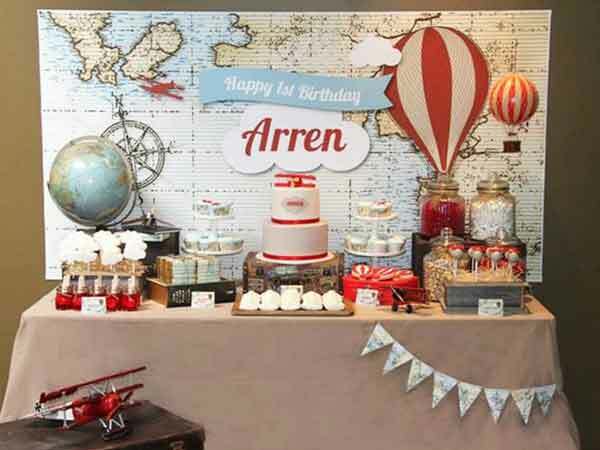 One of the easiest ways to create a dessert table backdrop is to buy pre-designed artwork, which can be personalized with your choice of text, then take the digital file to your local copy shop and have it printed to the size you want. 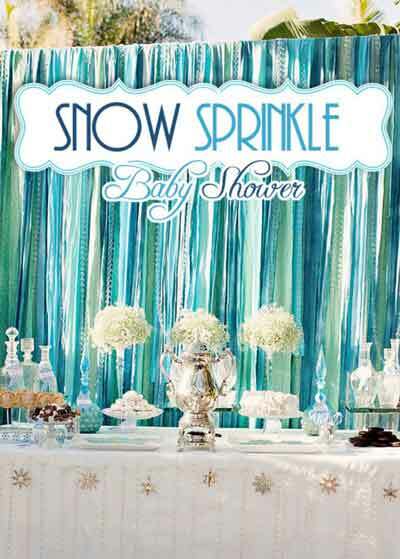 Check out this site for lots of different designs suitable for milestone birthday parties, weddings, kids birthdays, or baby showers. 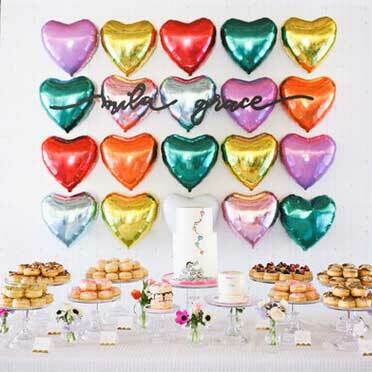 These helium-filled 36" giant balloons can be used to create a stylish dessert table backdrop when anchored down with balloon weights, like in the example below left by Amy Atlas. 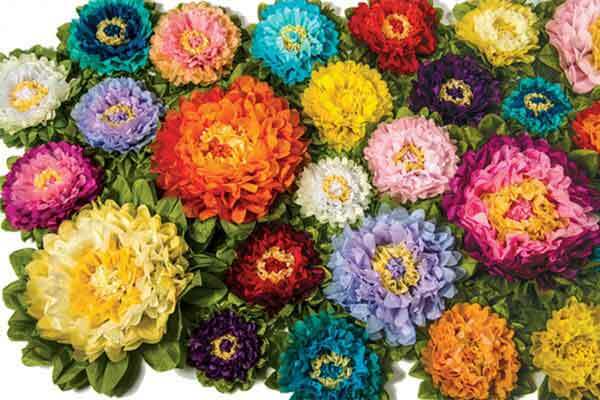 However, rather than arrange them in a row as she has, I think they look better when arranged in a cluster at varying heights as in the photo below center. Just remember to consider the background behind the balloons. 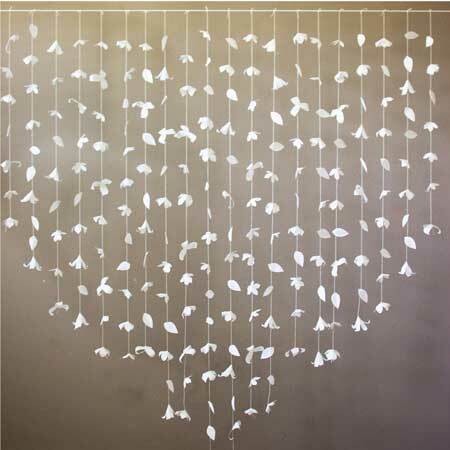 Ideally you want to arrange them in front of a plain wall or a large uncluttered window/french doors. 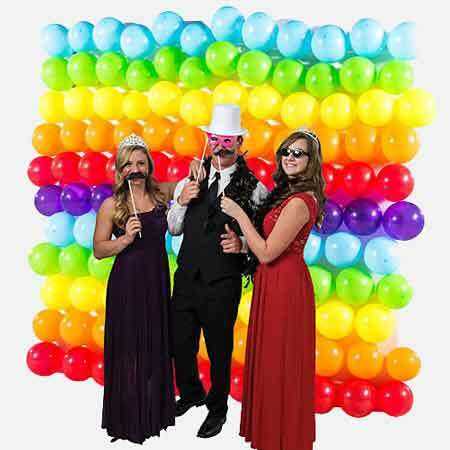 You can pick up clear confetti-filled giant balloons here, or colored ones here. 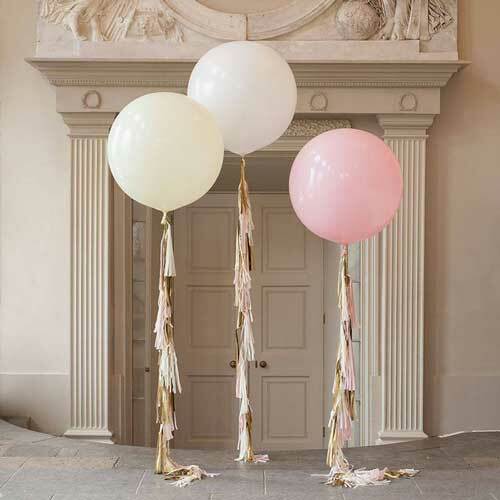 You can also use regular ones to create more of a 'wall of balloons' style backdrop by using different length strings when anchoring them (see photo below right). 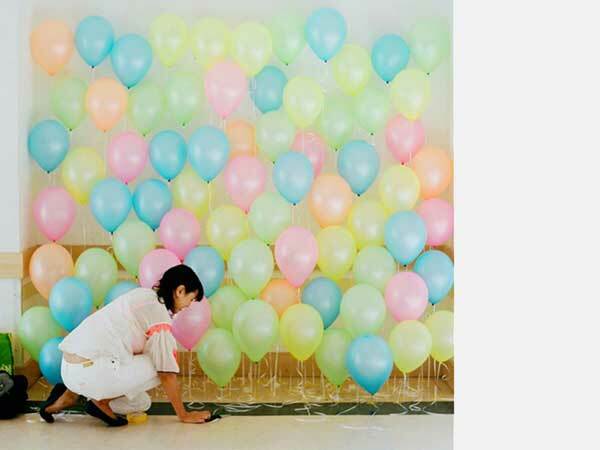 If it's a younger kids party, it's fine to use multicolored balloons. 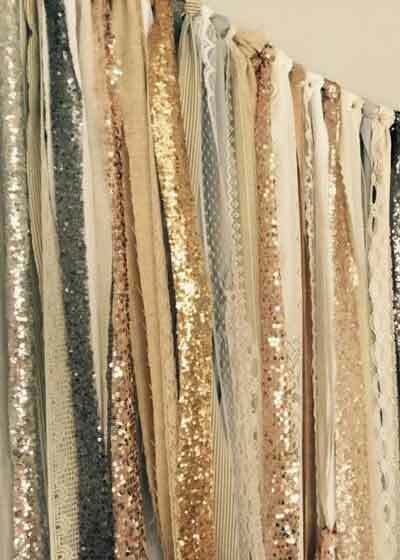 However, for a more sophisticated look you can create a nice ombre effect by arranging these in three rows with the darkest at the bottom and the lightest at the top, as in the photo below left. 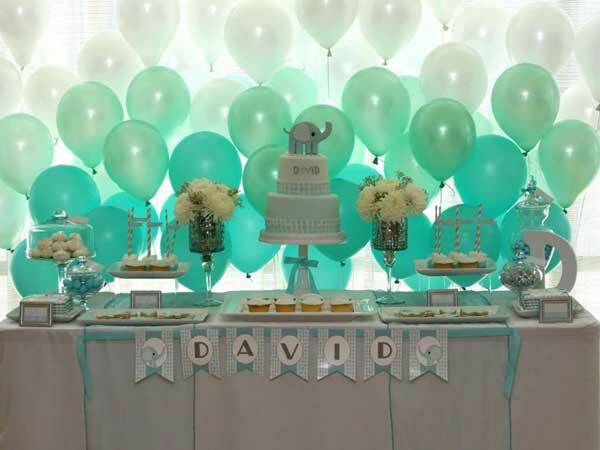 Alterantively, a single color can also look chic, and I quite like it when they're arranged loosely 'en-masse' running the entire length of the dessert table and flanking it at each end (see photo below center for a similar effect). 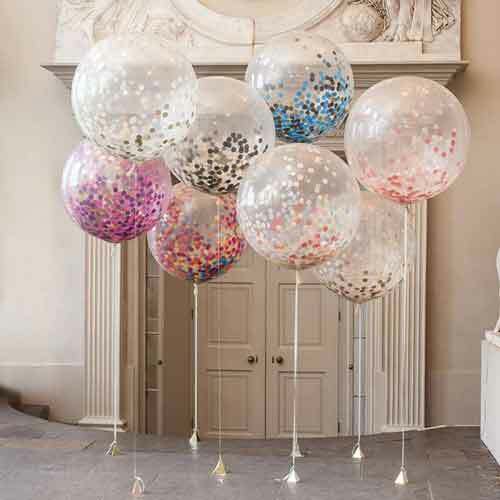 These look best when you use pearlized balloons such as these. 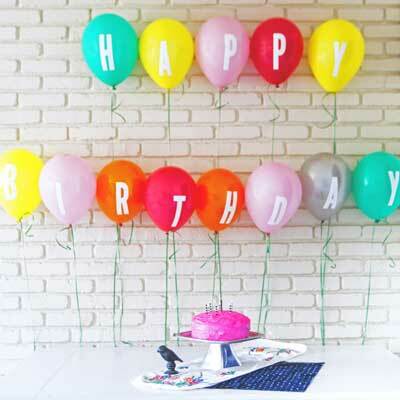 Get creative with these giant number and letter balloons to spell out names, years, words, or phrases to create a simple backdrop for dessert tables, buffet tables, and bars. 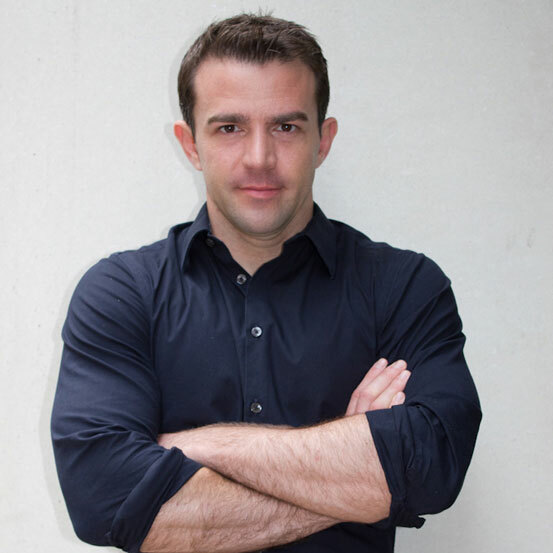 Again, you need to consider your background carefully, a plain wall works best to ensure the words can be easily read. 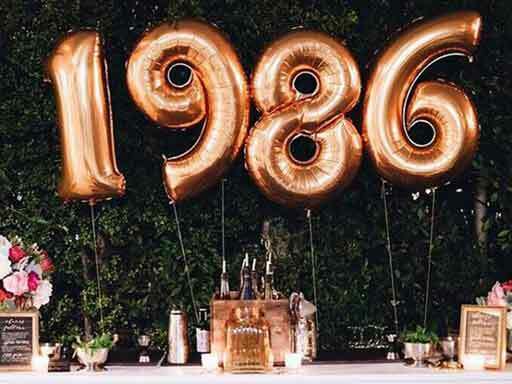 I also like the way they've created a background of other smaller ballons in the photo below right—although you might want to do these in a different color to really make the main word stand out. 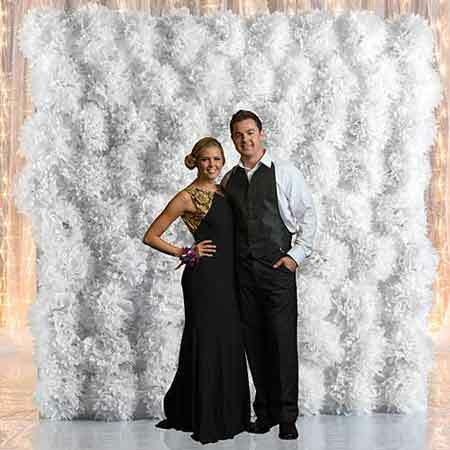 This 8ft x 8ft photo booth backdrop board (below left) is a handy and cost-effective structure to use for creating dessert table backdrops. 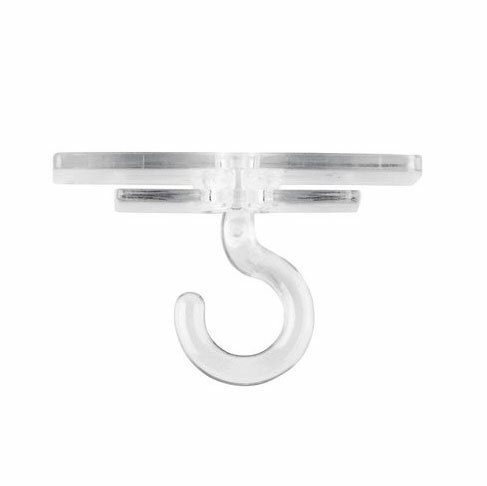 It comes with it's own leg supports to make it freestanding, and it's the type of thing you can use again and again. 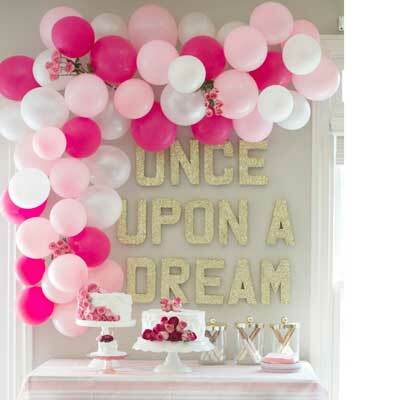 You can paint it or attach different finishes to it, such as balloons, tissues poms, or any of the following decoration ideas below. 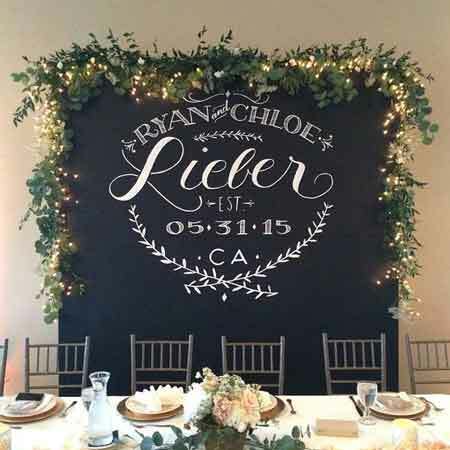 One option is to cover the backdrop board with chalkboard contact paper or chalkboard paint, both available here. 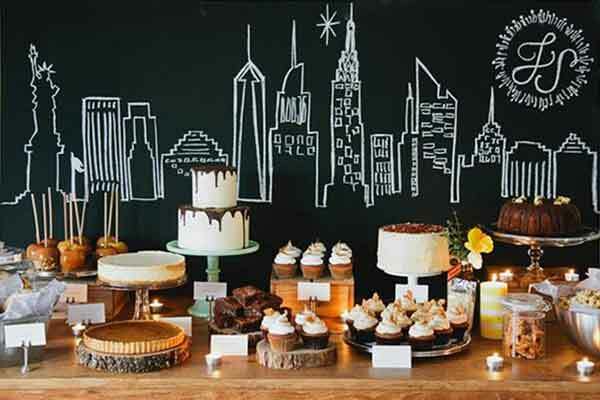 Use it to create simply hand-drawn backdrops, such as this New York skyline, or for a milestone birthday party scribble personal messages, greetings, and fun facts around photos of the birthday boy or girl from different stages of their life. 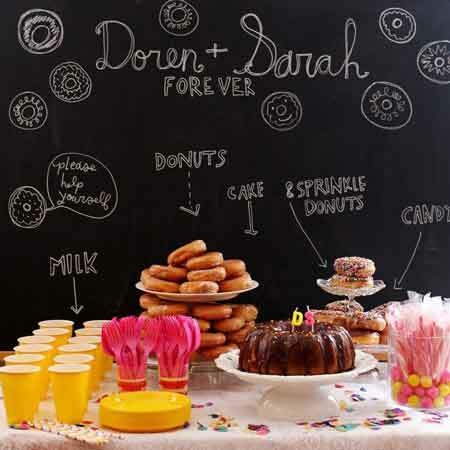 You could also use a chalkboard backdrop in a more practical way to identify different food items on a buffet / dessert table, like in the photo below left. Alternatively, pick a meaningful quote or song lyric, or just write the persons name(s) and date in a decorative way. 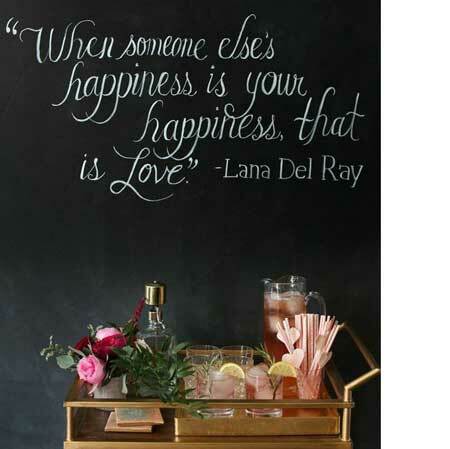 There's a great tutorial here for how to write nicely on a chalkboard using a homemade stencil. 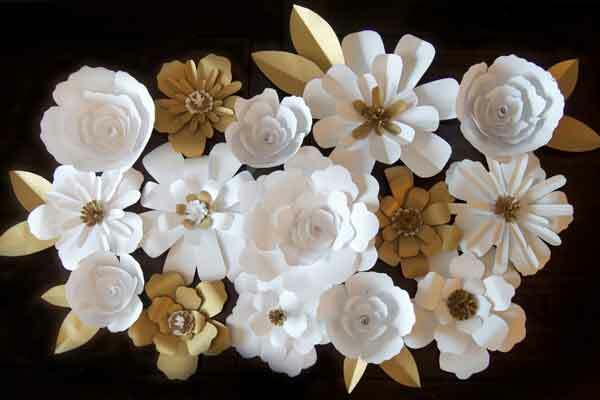 These paper flowers can be applied to the backdrop board above to create an elegant dessert table for a wedding or milestone birthday. You can pick up different colors and sizes here. 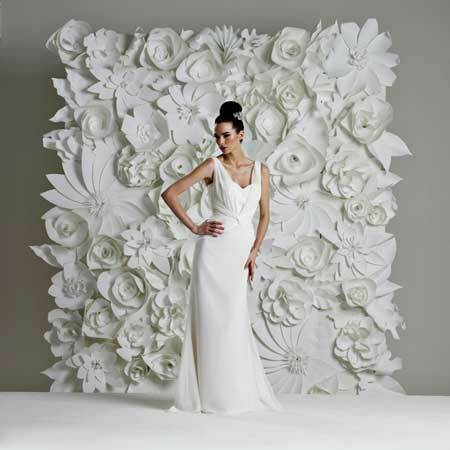 These paper flowers aren't that cheap so, depending on your budget, you might not be able to cover an entire backdrop board. 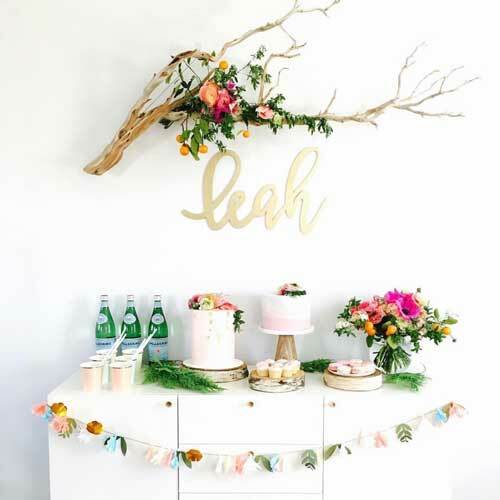 However, you can get arrangements like the ones below here, measuring 4ft wide by 2ft tall, which would allow you to create a nice display if arranged centrally on the wall behind the dessert table—or spread them out more loosely as if they are creeping over the wall like ivy. 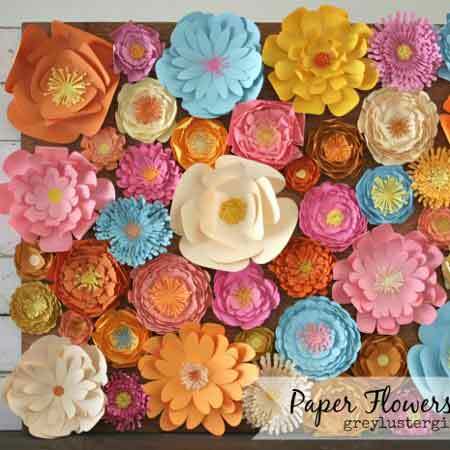 Another way to use the paper flowers is in conjunction with another decorative background and just have them creeping around the edges, such as in the photos below. 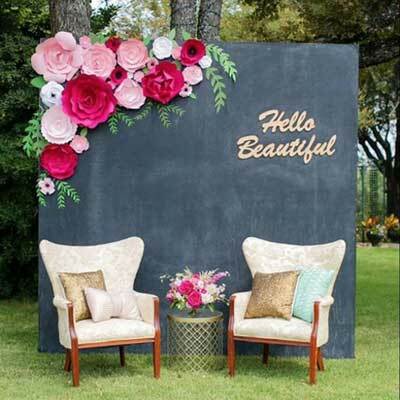 They work particularly well with the chalkboard background and text, or you can create a patterned backdrop, such as the one below left, by cover the backdrop board with decorative contact paper—see here for lots of different designs. 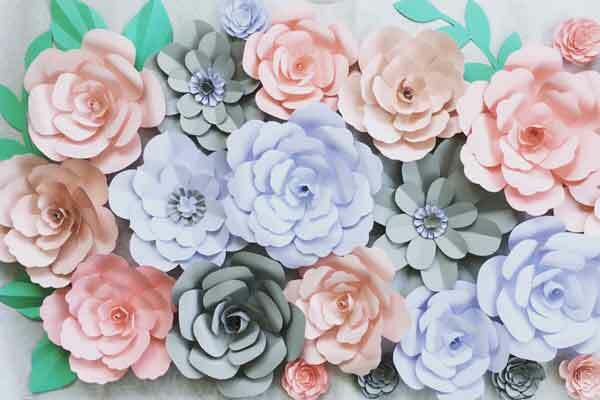 If you're on a tighter budget, you can create something similar using these tissue paper flowers (below left), available here. 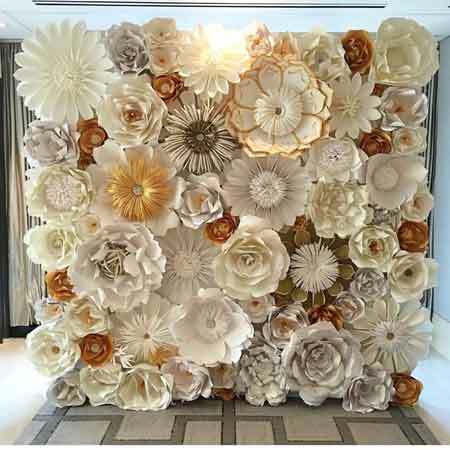 I think these would work best if you use just one color of flower, or perhaps 80% one color and then 20% of another just as an accent color, a bit like in the white and gold paper flower arrangement above. 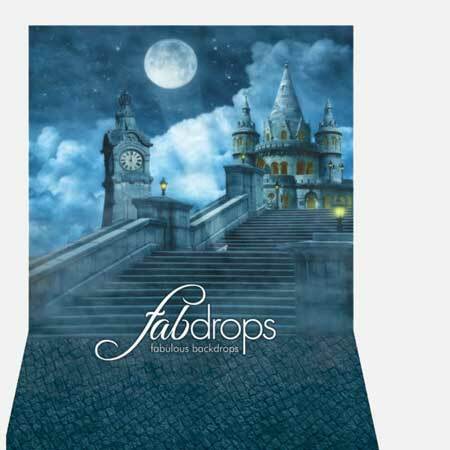 Other brighter colors, like the ones below right, are available here, or for pastel ones see here. 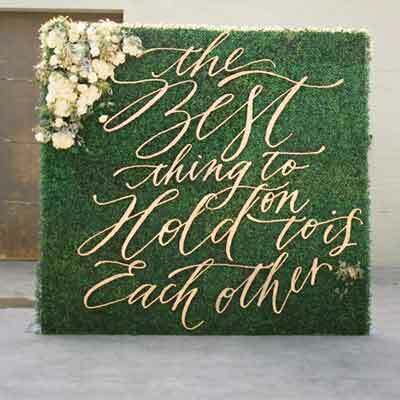 Another covering you can apply to the backdrop board is this artificial boxwood topiary hedging. 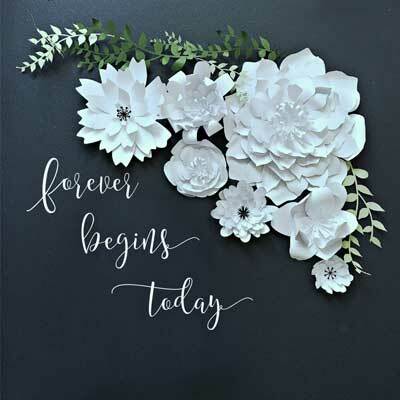 It comes in sections measuring 15" x 23", so approx 2ft x 1ft, and looks great with a few other decorative elements added on top, such as flowers, mirrors, framed photographs, lettering, garland banners, or even the letter balloons mentioned previously. 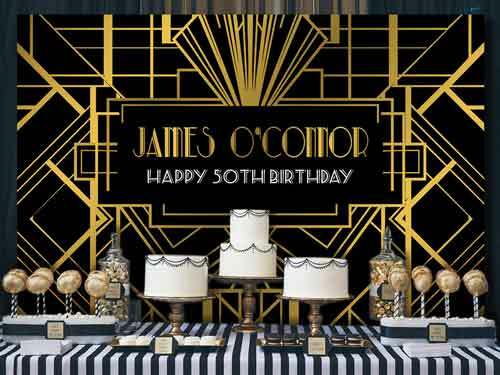 Sometimes it's enough to just use large 3D letters, applied to a simple textured or patterned backdrop, for your buffet / dessert table decor. 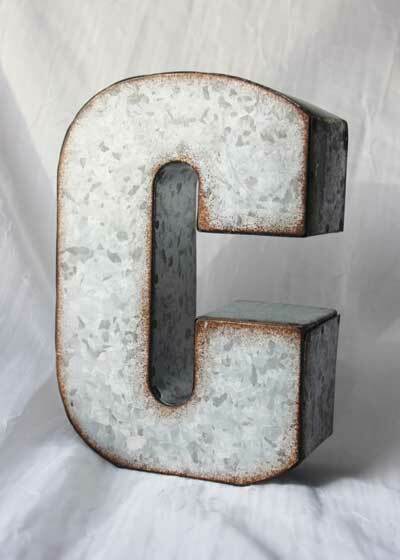 You can use this to spell out the birthday boy / girl's name or year of birth, but I think these are often less obvious when used to spell out simple words and phrases, such as celebrate, cheers, 50 and Fabulous, or oh what fun! 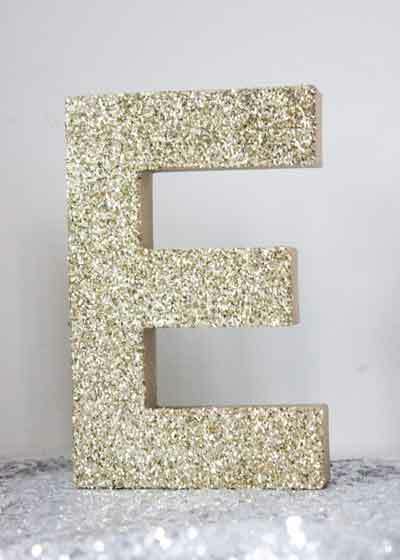 You can get 3D letters made in lots of different finishes, such as glitter-covered, metal effect, or even planters to create floral letters. See here for these. 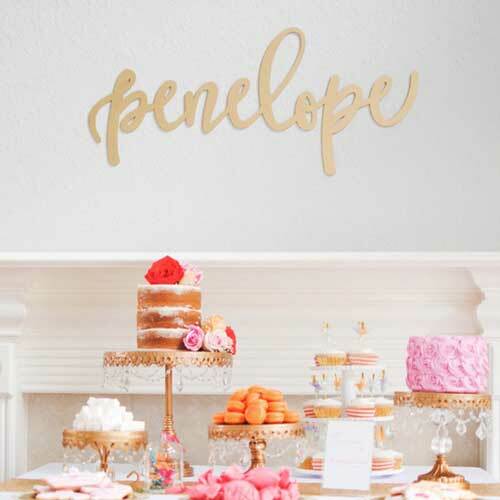 Alternatively, you can also get these calligraphy stlyle name signs, which work well on many different backgrounds, or if you have a larger budget then these marquee light letters would make for a very dramatic dessert table backdrop. Both are available here. 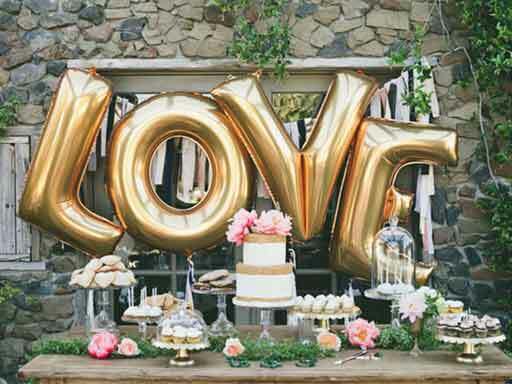 3D letters, whether glitter covered, metal, balloons, or calligraphy name signs, also work well when combined with balloon backdrops—either as a solid wall or just corner arrangements. 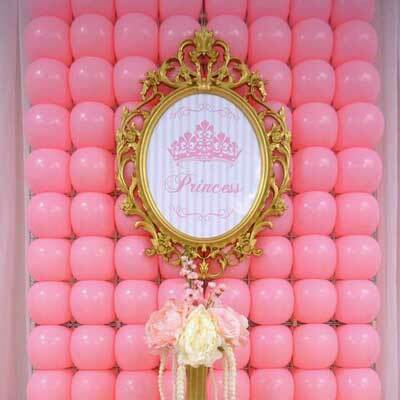 Other ways to use balloons include sticking them to a backdrop board in a grid shape to give a more defined 'wall of balloons', as per the photo below left. 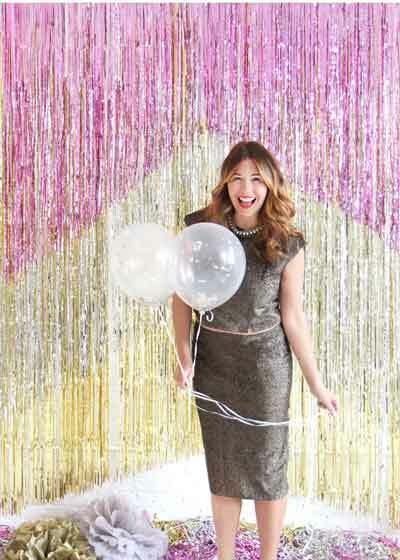 This is a great look for an adult birthday party and would also work well with just one color of balloon. 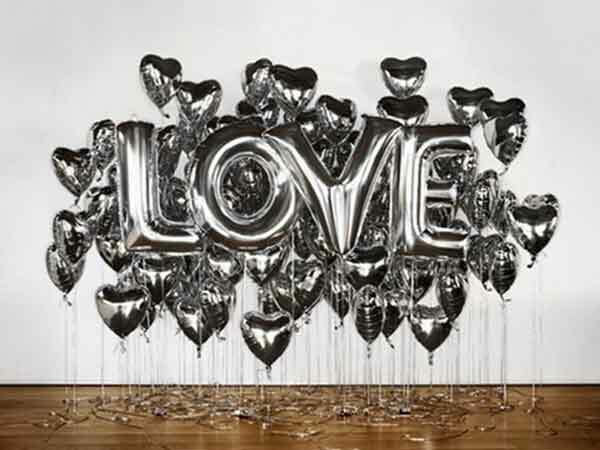 Alternatively, you can apply these adhesive vinyl letters to balloons to spell out anything you like, see below center. 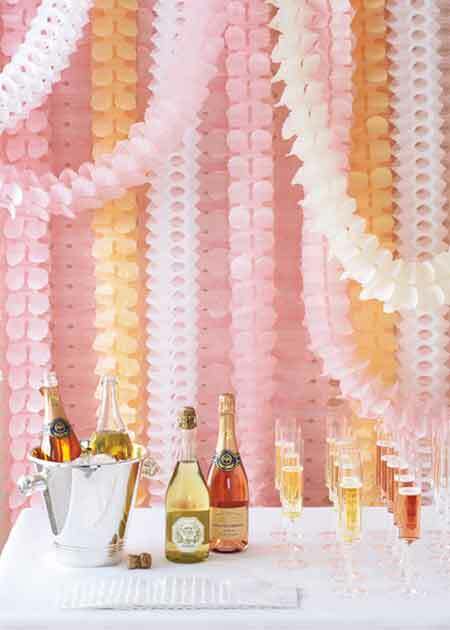 Finally, if you want a tight balloon wall finish, as in the photo below right, pick up some of these plastic grids, available here, which you just insert regular balloons into before hanging on a wall / backdrop board. 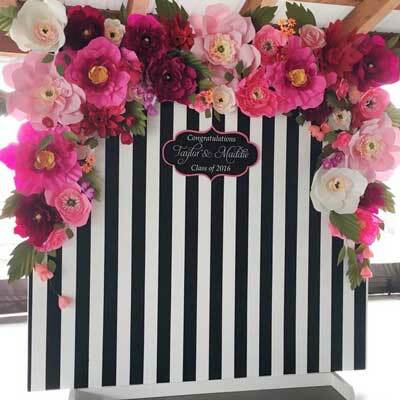 Another easy way to create a desssert table backdrop is to simply cover the freestanding backdrop board with contact paper or inexpensive peel & stick wallpaper. 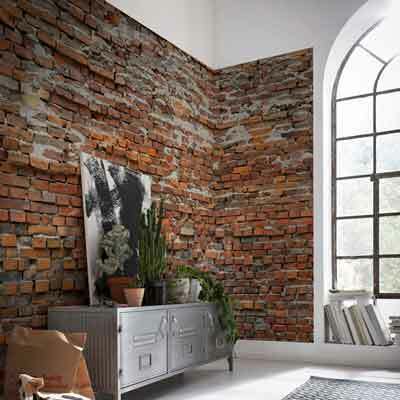 This is a really cost effective option and there are lots of different finishes available, include various wood and brick effect, strips and patterns, and photographic / scenic views. 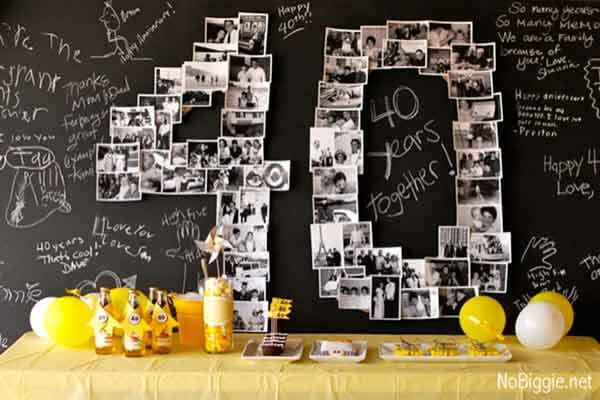 I particularly like the picture frame design, below right, which would work really well for a milestone birthday if you filled each frame with a photo of the birthday boy or girl from different stages of their life. Check out the full range here. 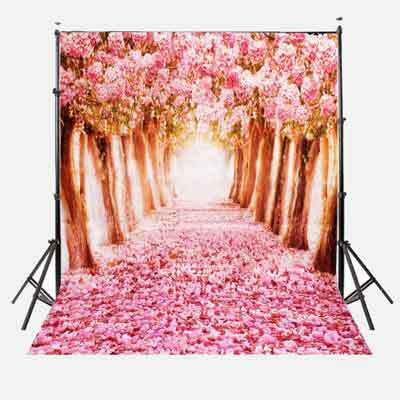 These inexpensive photographic backdrop support frames are also a great option to create lightweight dessert table backdrops and you can pick them up here for around $30. 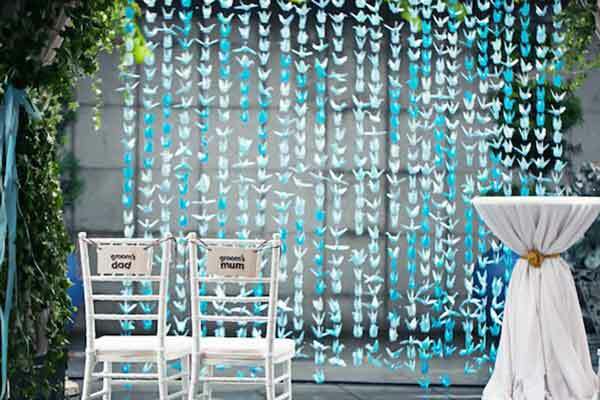 The great thing about this support frames is that you can use it again and again to create different backgrounds for buffet / dessert tables—or use it for photos at your party! 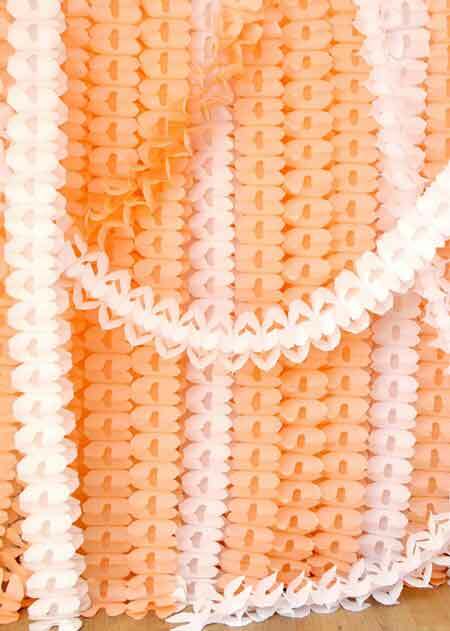 Just remember to blend the edges / legs by covering with balloons, tissue poms, swags of fabric etc. 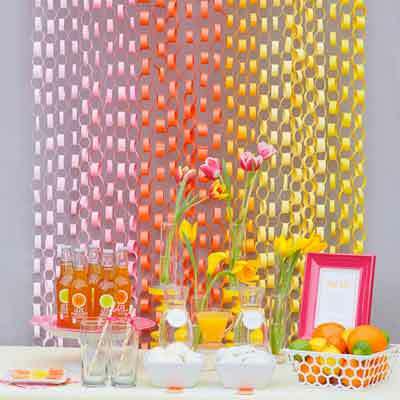 Cut fabric into strips (or use ribbon) and hang them from the support frame to create a fabric backdrop for your dessert table. Avoid a hard candystrip effect by using several different colors, or if only using two colors, as in the photo below center, don't alternate the colors, instead hang them in an irregular order. 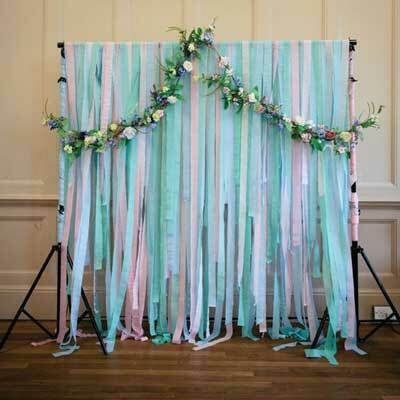 Check out this site where you can buy color co-ordinated fabric strips such as the ones shown below right. 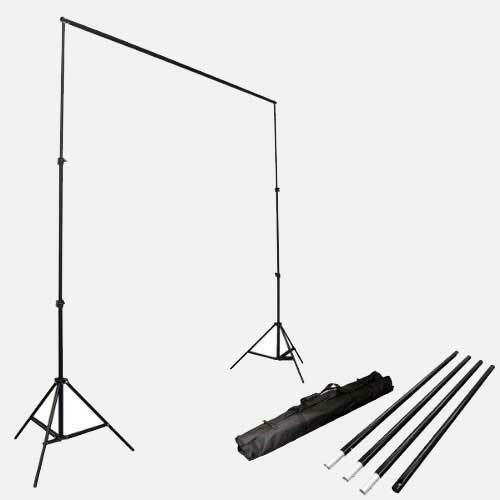 Alternatively, you can just hang fabric curtain style from a support frame. 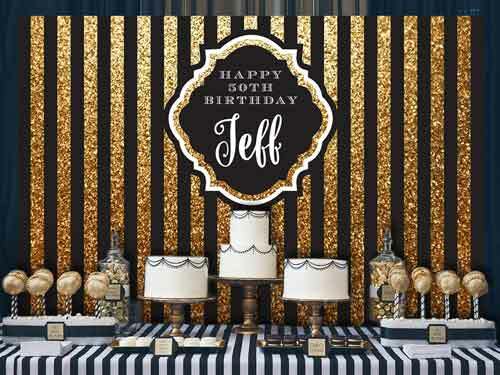 I particularly like these glitter fabrics which work well for dessert tables—especially for adult birthday parties. Check them out here. 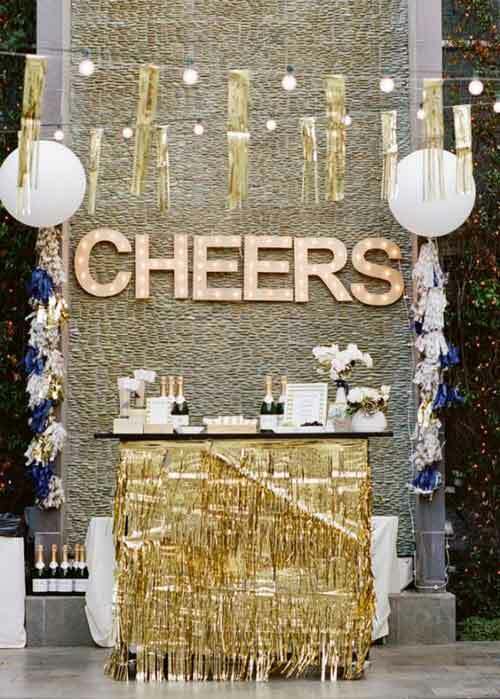 Remember that a little glitter fabric goes a long way, so combine it with a solid color tablecover to avoid it looking tacky. 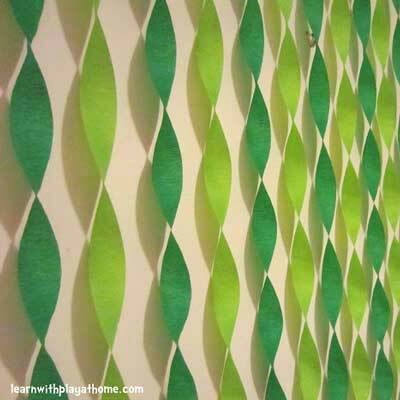 Check out this tutorial by Jenni at I Spy DIY for how to layer 3 different colored metallic foil curtains and cut them into a chevron pattern. 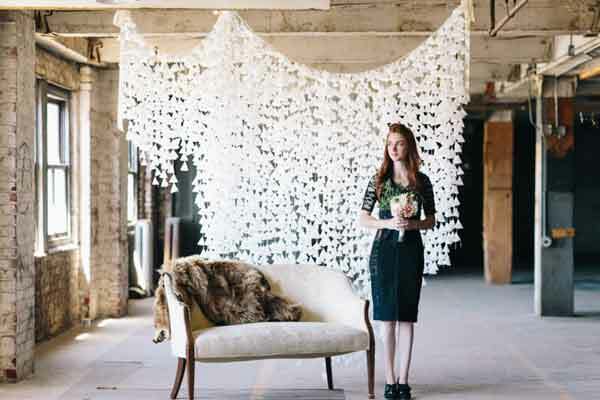 It's a great way to make a simple backdrop a bit more special. 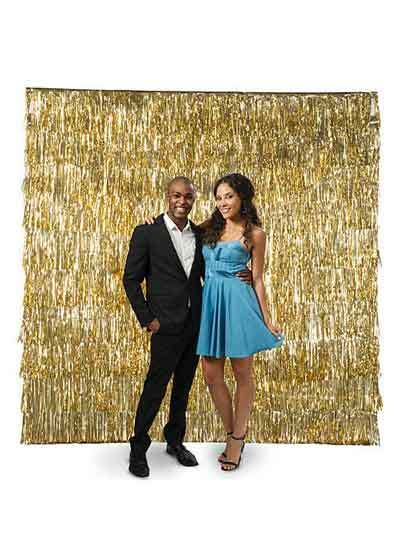 Alternatively, you can create a more textured effect by applying rows of metallic fringe on a roll to a backdrop board, below right. 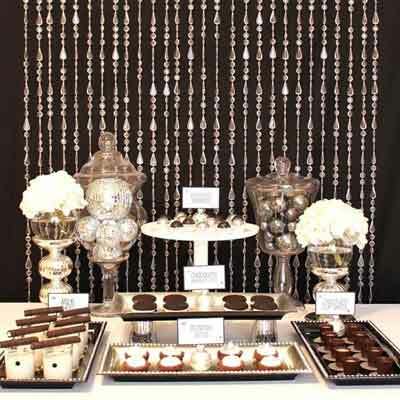 Acrylic bead curtains are an easy way to create an elegant backdrop for a dessert table, or you can buy individual strands / beads on a roll and hang them yourself from the support frame. Get them here. 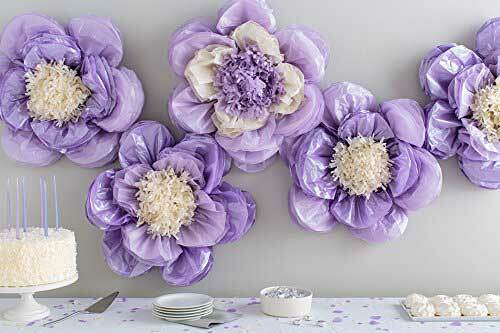 Similarly, there are lots of paper flower garlands available here, including these unusual ombre paper circles which give a more layered look. 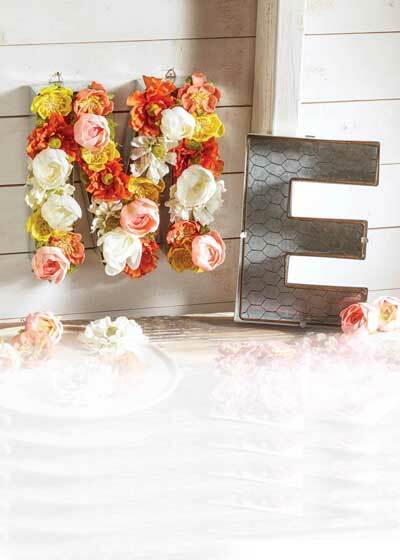 Again, remember to think about the background behind bead / paper flowers. These look best against a solid color wall / fabric. If the background behind is too busy, they will be hard to see and you'll loose the overall effect. 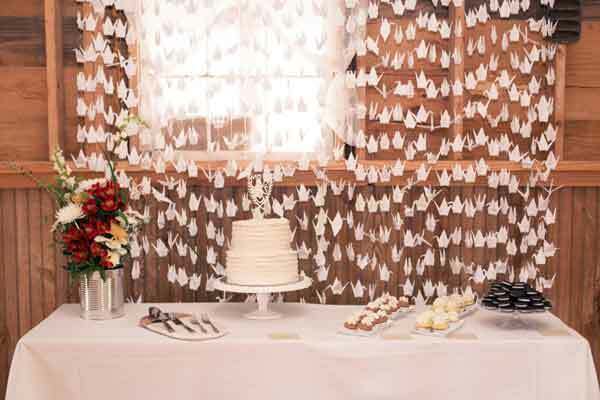 These paper crane garland decorations would also make a lovely dessert table backdrop—especially for a wedding or baby shower. Check them out here. 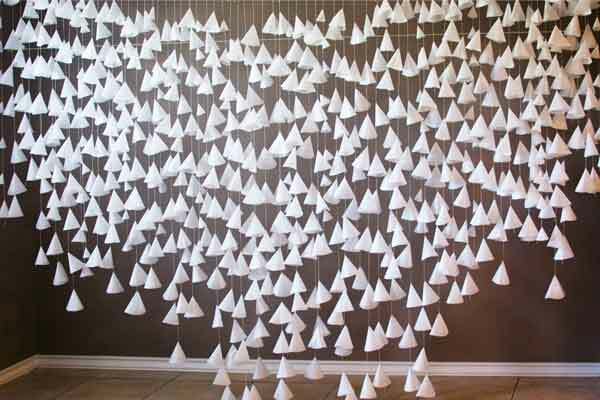 Similarly, these more abstract wax paper cones are often used for fashion and photography backdrops and look quite stylish. Check them out here. 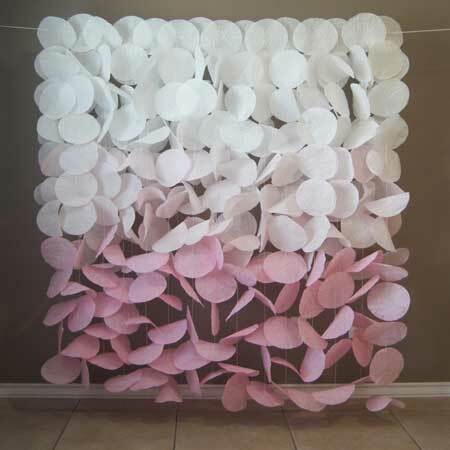 A more budget-friendly option is to hang these leaf tissue garlands vertically from the support frame. 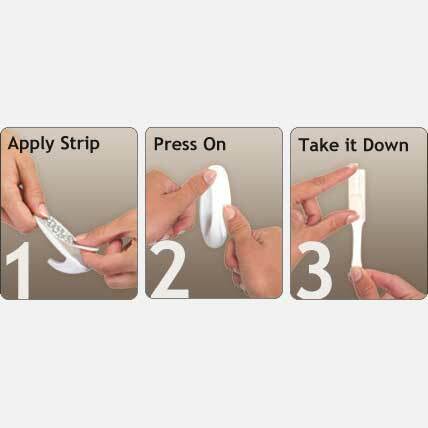 Be sure to use at least 3 different colors, rather than 2, to avoid that hard candystrip effect. Check them out here. 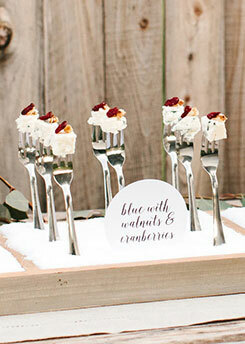 Photographic backdrops are a great way to create a more theatrical scene or add a sense of depth to your dessert table. When choosing an image, remember that the bottom third will probably be eclipsed by your dessert table so you need to choose one where the important parts are in the top two thirds. 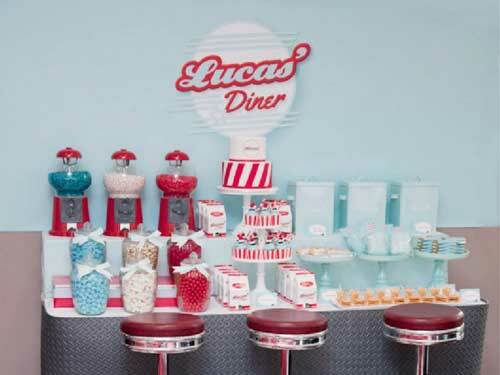 For example, the dessert table would probably only obscure some of the steps in the Cinderella-style image below left, so this would work well. 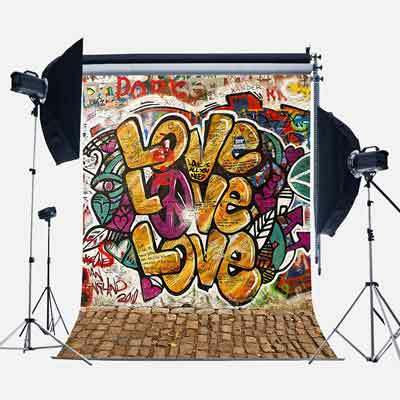 Whereas, in the graffitti image, below center, the bottom 'LOVE' would probably drop behind the dessert table. If you do find an image like this, where some of the bottom would be obscured, check whether there is any spare space at the top of the image that you could happily lose. If so, you could roll it up a little at the top to make the bottom part of the image more visible. Another thing to make sure you check is the size. 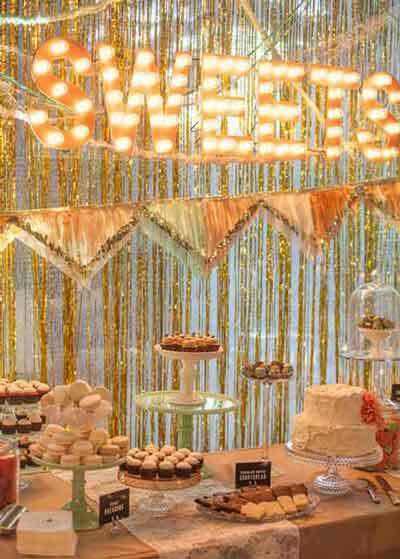 Some photobackdrops are quite small, so they won't provide enough coverage to act as a backdrop for a dessert table. Depending on the length of your table, you probably want something in the region of 8ft x 8ft or larger. 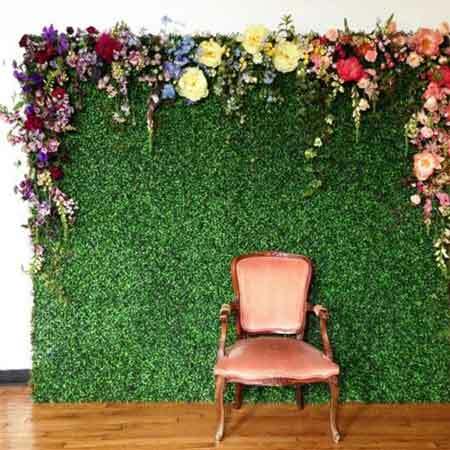 Also, these backdrops work best when you blend the hard edges with fabric, props, or other decorations—so the image doesn't just stop at the sides—as in the photo below right. Check out a large range here, or some others (including the Cinderella image below left) are available here. 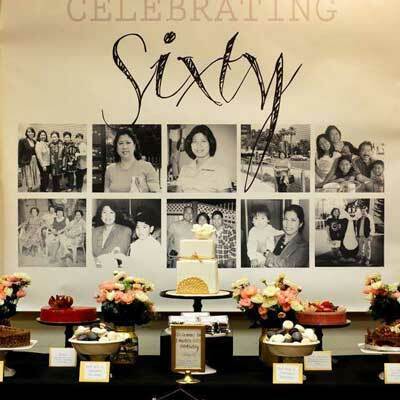 I came across these photos of a 60th birthday party, below left, where they'd created a lovely 'Through the Years' style backdrop using photos of the birthday girl at different stages in her life. 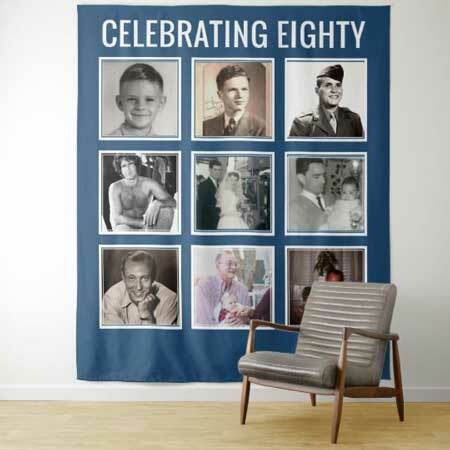 These photo collage-style tapestries, below right, would make creating something similar really easy—as you can see in the mock up I created below 'Celebrating Eighty'. You can customize the tapestry with your own text and colors—and even remove the bottom row of images if you want to position a buffet / dessert table in front (although I would keep all the photos and just hang it higher). 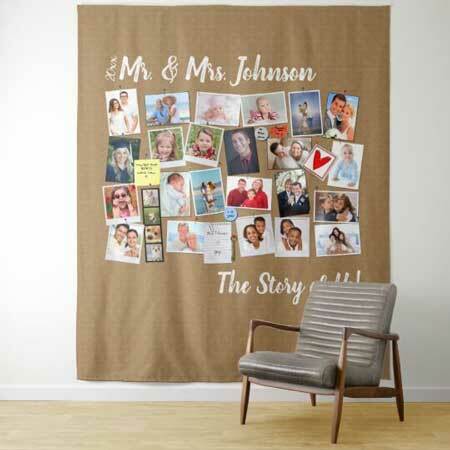 There are other photo collage tapestries available that you could also customize, such as this 'Story of Us' example, below right. Check out all the options here. 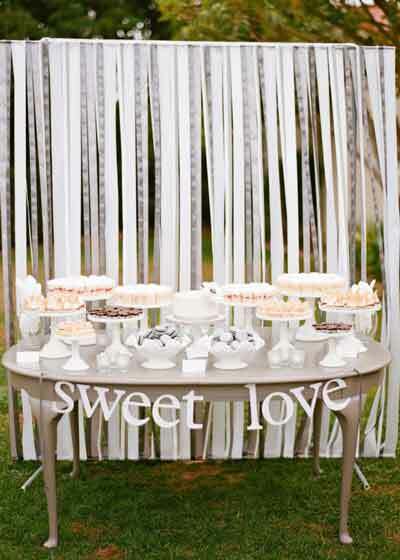 Another budget-friendly option is to use paper streamers to create a dessert table backdrop. You can hang them or twist them, but personally I like the way they've layered them at different heights in the image below center left. 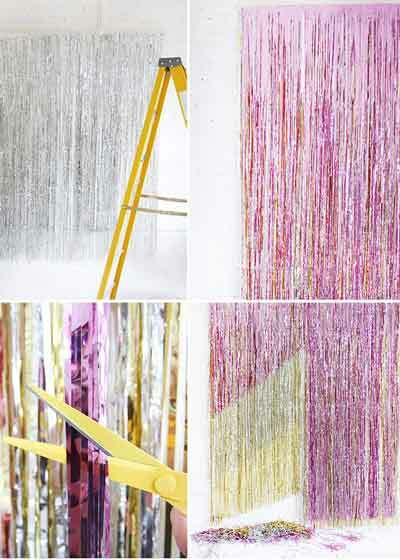 Alternatively, you can do something similar with paper chains. 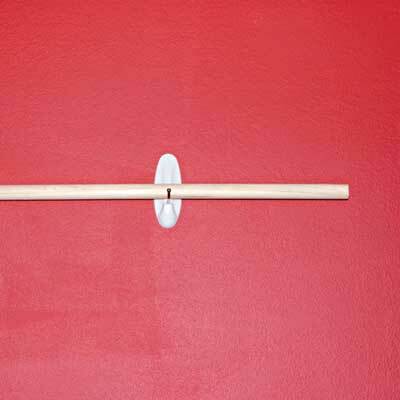 If you don't want to invest in cheap photographic backdrop frame, another way to hang lightweight decorations such as these is to hang a 48" dowel using these Command damage-free hooks. 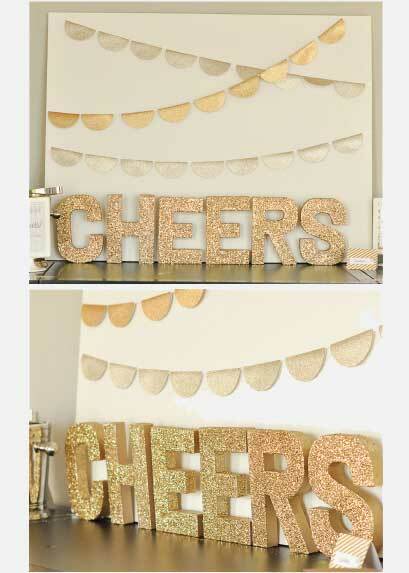 They're adhesive and remove easily so are great for temporary party decorations. 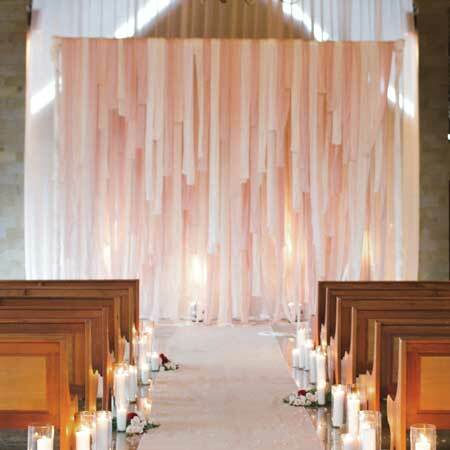 If you want a greater width, just use 2 dowels and create the streamer backdrop in two sections. 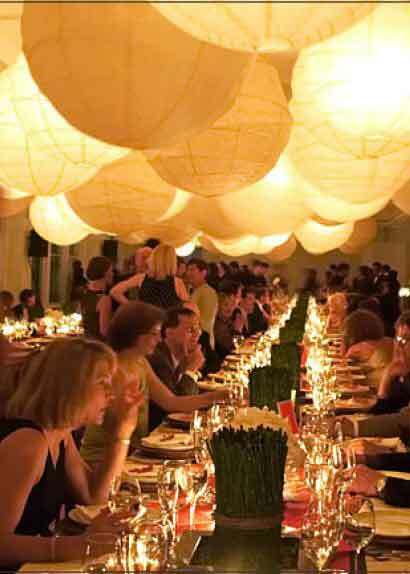 Paper lanterns, when hung in a central cluster over a table, as in the photo below left, make a very dramatic statement. 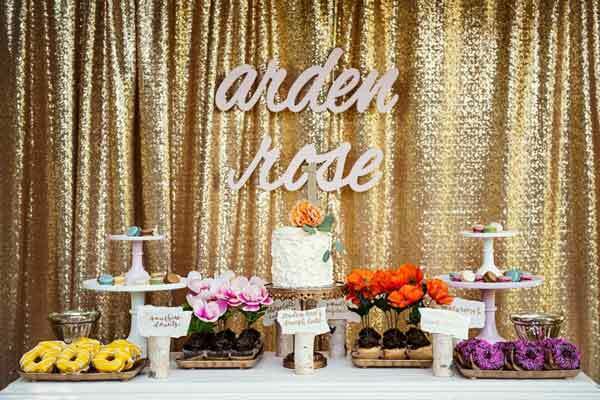 If you hang them lower than normal, against a solid color wall, you almost don't need a dessert table backdrop as they become the main decorative feature. 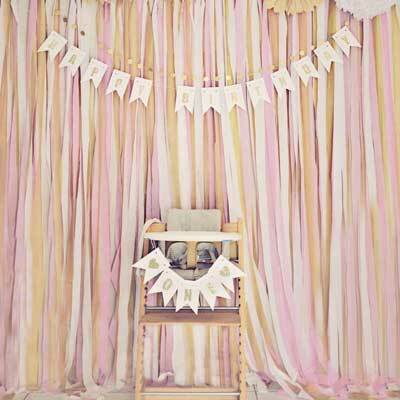 Alternatively, just combine them with a simple fabric or contact paper backdrop, as in the example below right. 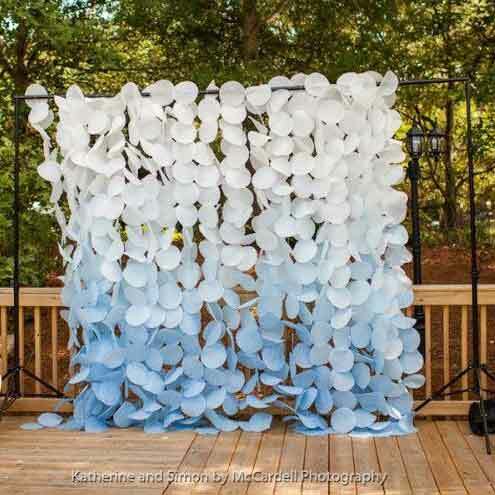 Be sure to use either accordian style paper lanterns (below right) or regular lanterns with free-style ribbing inside, rather than those with traditional parallel ribbing. This will ensure they look decorative and not functional. 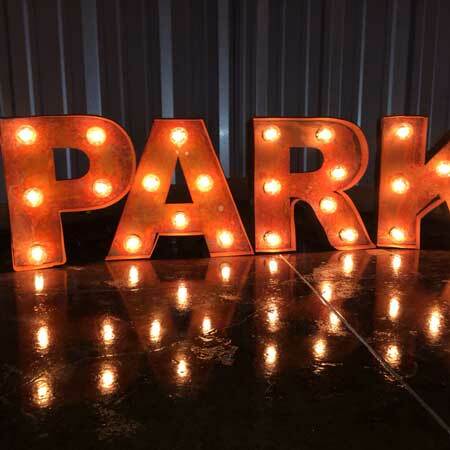 See here for the best range of decorative lanterns. 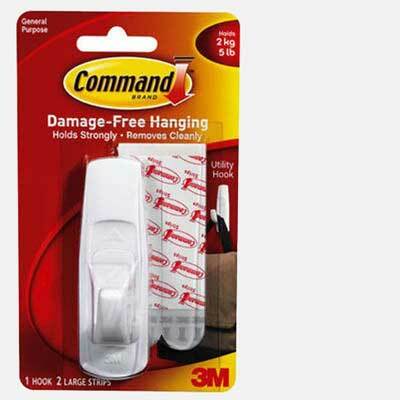 To hang the lanterns, use these Command damage-free party ceiling hooks. 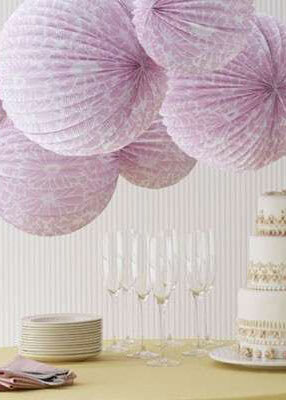 They apply with an adhesive strips and remove easily without damage so are perfect for hanging party decorations. 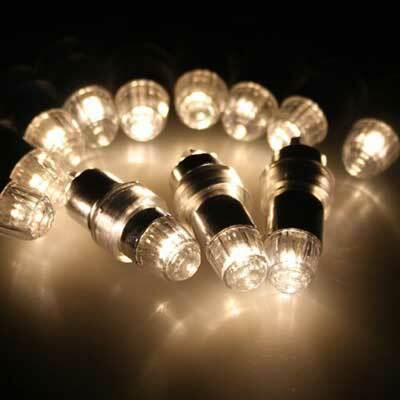 You can also pop these inexpensive battery powered LED lights inside the lanterns to give a lovely warm glowing effect (as in the example above center). Check them out here. 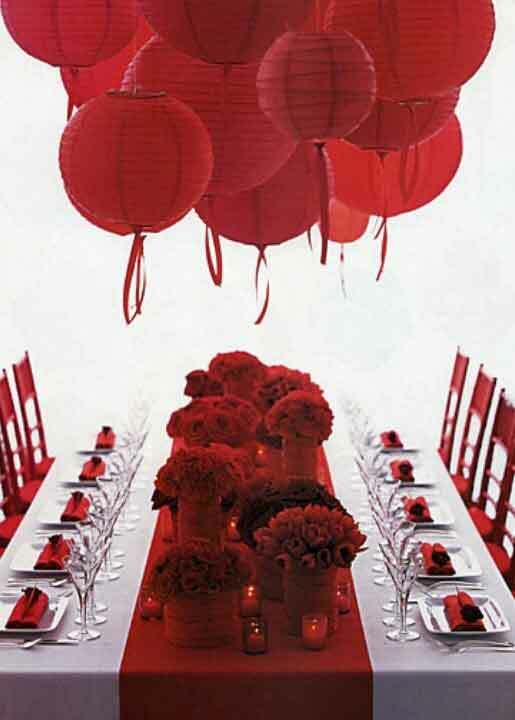 Alternatively, you could arrange the lanterns in longer thin rows, running the length of your dessert table, as per the photos below (which are hung with the Command party ceiling hooks, although I would recommend using some sort of invisible thread). 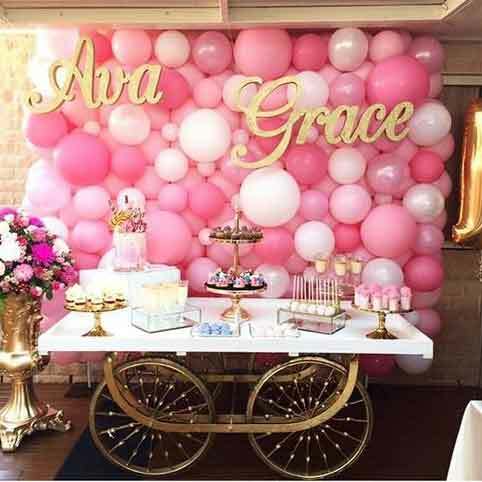 Again, I would suggest letting these hang down lower than normal and filling the gap between the bottom of the lanterns and the top of the dessert table foods with some sort of signage/banner, such as the calligraphy name signs or glitter letters mentioned previously. 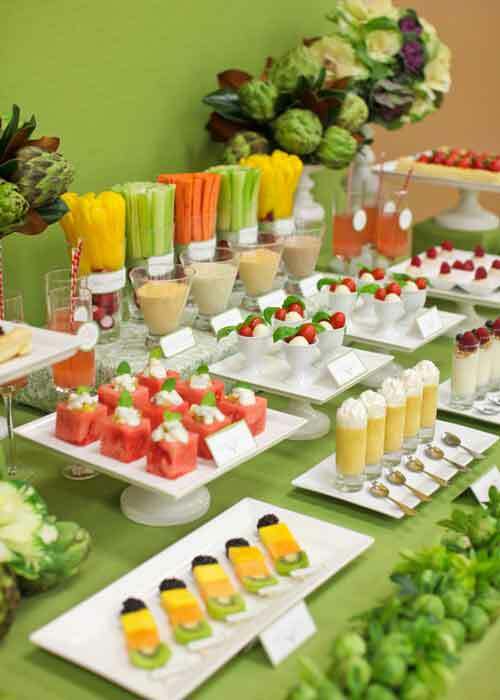 Arrange these components so there isn't too much empty space between them—a bit like in the photo below right, if we assume the dessert table foods are just a few inches below the Congrats banner. Snug, not windy. 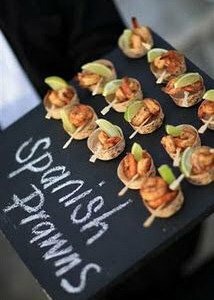 Now that we've looked at options for the dessert table backdrop, head over to my other page of buffet table ideas for food styling and presentation tips. 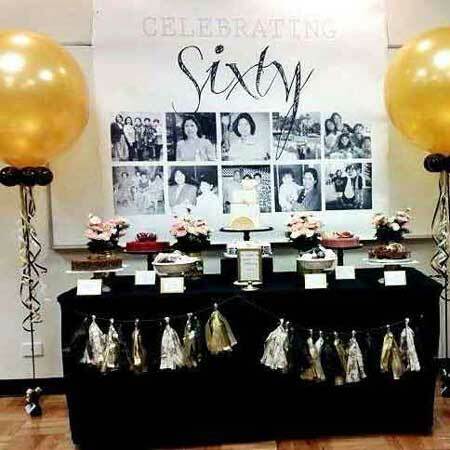 If you've enjoyed these dessert table ideas, please help me to promote my website by sharing this page. Just click on the Facebook or Twitter buttons below to post a link back to this page, or share this collage image. Alternatively follow the "Enjoy this page?" 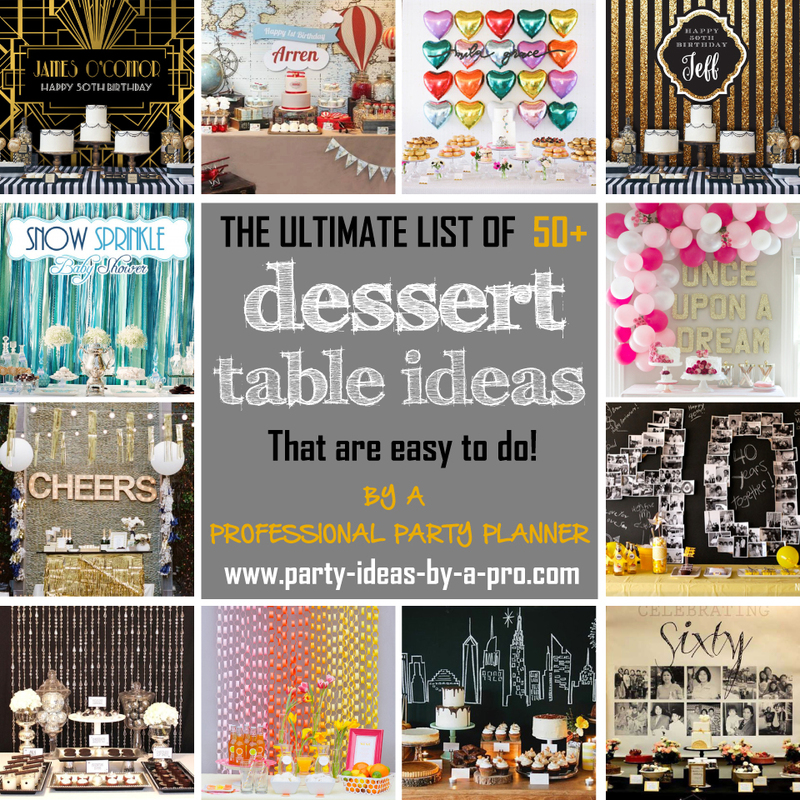 link under the logos below to get the address for this page of dessert table ideas so you can paste directly into your own blog, website, or any forum that you contribute to.